Collector for ArcGIS and Operations Dashboard for ArcGIS have been updated at 10.2 to include display, configuration, and workflow enhancements that improve field data collection and enterprise oversight. Both apps are available at no cost to Portal for ArcGIS users and ArcGIS Online subscribers. 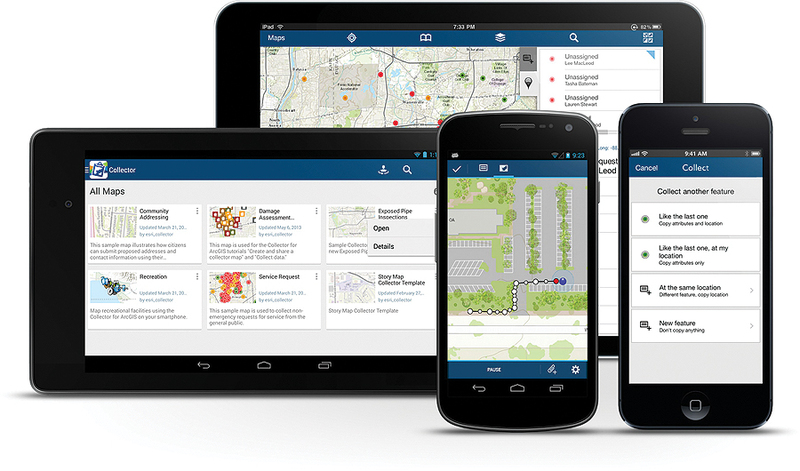 At version 10.2, Collector for ArcGIS includes an updated user interface and support for iPad and Android tablets. Collector for ArcGIS is a native, configurable field data collection app for iOS and Android that improves the accuracy and currency of spatial data. It is a companion to Operations Dashboard but can also be used in a stand-alone environment. Field-workers can download maps using Collector and then capture data, attach photos and video, plan routes, and get directions. Information can be transmitted and immediately displayed in Operations Dashboard and shared throughout an organization in real time. At 10.2, the user interface for Collector has been refreshed and now includes support for iPad and Android tablets. Templates, selection results, directions, and more, can now be viewed alongside the map on mobile devices with larger screen real estate. Collector at 10.2 also expands the types of data that can be collected. The input of GIS features for all primary shape types (e.g., points, lines, and polygons) is now supported. The app also gives you the ability to view and control GPS accuracy when capturing features so you can stream positions from the GPS as you move. Data capture often involves recording repetitive information at different locations and/or multiple features of different types at the same location. To reduce that manual repetition, Collector at 10.2 includes a continuous collect mode that allows users to copy the location or attributes of the last collected feature, saving time and effort. Collector for ArcGIS can be downloaded directly from the Apple App Store and Google Play. Operations Dashboard for ArcGIS is a Windows-based application that provides real-time access to information. Users can monitor and manage an event (or series of events), track field personnel, and assess daily operations within their organization. The app integrates interactive maps and a variety of dynamic data sources, including bar charts, lists, histograms, gauges, and other performance indicators, based on live geographic information defined in a web map or web service. Operations Dashboard is available for use on Windows desktops and Intel-based Windows 7 and 8 tablets. Microsoft .NET Framework 4.5 is required before downloading the application from ArcGIS Online. At 10.2, the Operations Dashboard application improves the way you work with data. Because the dashboard enables you to view extensive lists of information, the ability to search within lists has been added to quickly find what is needed. You can now see charts, graphs, custom text, and photo attachments within each pop-up window. When displaying information within graphical widgets, such as pie charts, you can now include labels so those viewing Operations Dashboard can better understand the values that appear. You can also filter the map and all widgets using relative time, such as within the last hour or month, or after a specific date. This helps monitor and analyze data that changes rapidly over time. Operations Dashboard for ArcGIS now fully supports Portal for ArcGIS, as well as ArcGIS Online. A new configuration utility is available to Portal for ArcGIS users, making it easy to sign in and deploy the Operations Dashboard app on-premises. Portal for ArcGIS users can access the Operations Dashboard application from the Esri Customer Care portal.